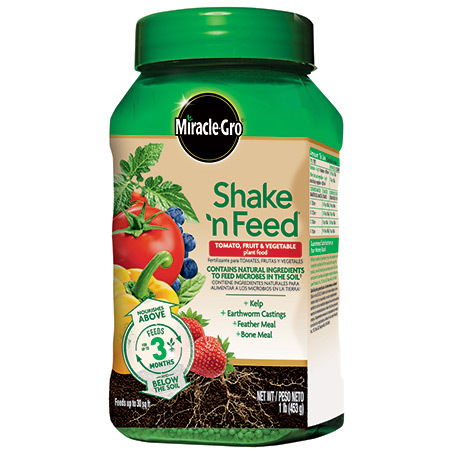 Miracle-Gro® Shake 'n Feed® Tomato, Fruit & Vegetable Plant Food contains vital micronutrients, plus added natural ingredients, to nourish above and below the soil. It contains kelp, earthworm castings, feather meal and bone meal in an all-in-one particle. Added calcium helps form stronger cell walls, producing better quality and longer-lasting fruits and vegetables versus unfed plants. Plus, it helps prevent disorders in edible crops commonly associated with calcium deficiency. You can use it anywhere: in-ground and in containers with continuous feeding for up to 3 months. 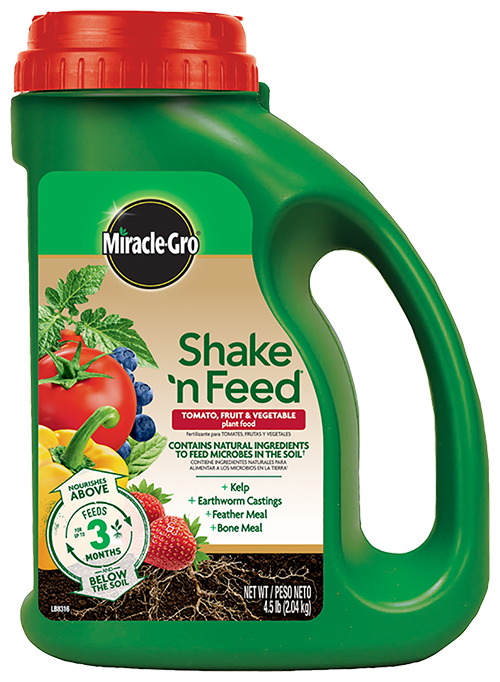 Feed your plants with the help of Miracle-Gro® Shake 'n Feed® Tomato, Fruit & Vegetable Plant Food. 1 lb. bottle covers 30 sq. ft.
4.5 lb. jug covers 128 sq. ft.
Great for use anywhere! In ground and in containers! In-ground: Shake plant food evenly onto soil using the illustration on the package as a guide (apply dry, do not pre-mix with water). Do not apply to wet foliage or pile against plant stem. This application rate equals 4 tablespoons per 4 sq. ft. (2' x 2'). In Containers: Mix recommended rate (see Amount To Use Table on package) into soil at time of planting or sprinkle over soil surface after potting. Apply every 3 months during the growing season. Calcium helps form stronger cell walls, producing better quality and longer-lasting fruits and vegetables. Plus, it helps prevent disorders in edible crops commonly associated with calcium deficiency. Miracle-Gro® Guarantee: Within 6 months of purchase if you, the consumer, are not completely satisfied with the results after using this product, we will refund your purchase price in full. Grows bigger, more bountiful vegetables than unfed plants. Specially formulated to deliver bountiful harvests for tomatoes and other vegetables.